Has anyone else noticed the barrage of hot cross bun related commercials and media coverage over the past couple days? There's no escape! Not that I was going to avoid these goodies. I'm of the firm belief that holidays call for special breakfasts! The addition of banana topped with nut paste and a sprinkling of coconut flakes plus walnuts was my attempt to healthify the plate, which is something I always try to do when I feel I'm being a little naughty. However, I do think chocolate is perfectly acceptable for breakfast over Easter so the choc chip hot cross buns I'm planning on devouring on Saturday should go down well. In fact choclate will feature heavily in my diet over the next three days too. By three I mean at least ten due to post-Easter sales. How can one refuse discounted chocolate? And why is it that milk chocolate seem to taste so much better in egg/bunny form? Well rather than question it, I'm going to embrace it...everyday, each meal for as long as I can reasonably manage. What will you be eating this Easter? 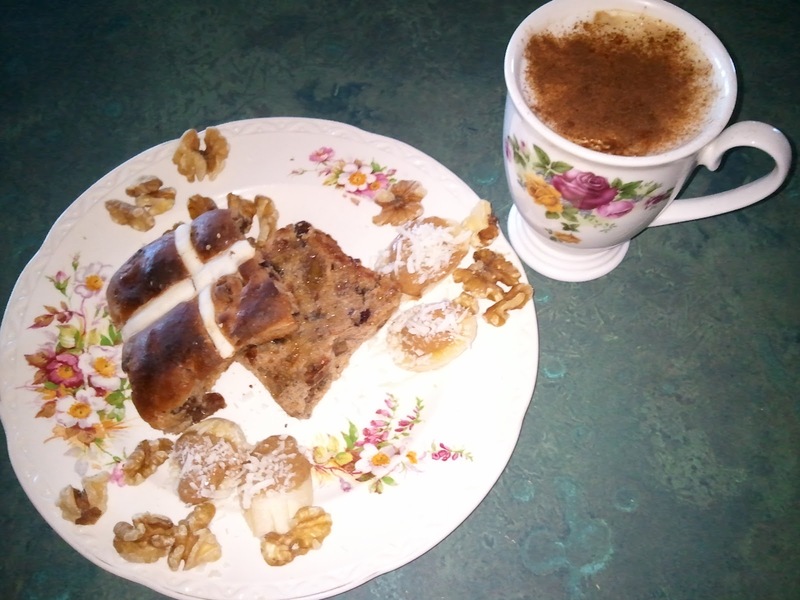 Yes, it definately satisfied my hot cross bun cravings! Didn't stop me having another one for afternoon tea though :). I am a scrambled eggs devote too - so quick and easy to make and can be adjusted in so many ways. Pairing with asparagus = pure joy! I have a new outfit post and i'd love if you stopped by!